Welcome to our baby boy's circus room tour! 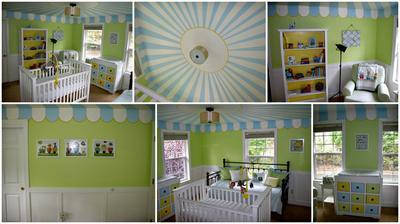 Our baby boy's big-top nursery theme was inspired by an example that was featured in the Pottery Barn Kids Catalog. We loved the design and everything about it so we copied it very closely except we changed the color scheme. Initially, we had considered an elephant themed nursery which after we saw the photo layout in PBKids we converted our original ideas into a circus theme that included other animals as well as elephants. What brand and paint colors did you choose? We used (low VOC) paint/primer in the Behr and Glidden brands from Home Depot. I can't remember the exact name of the blue, green and yellow colors because we went through so many samples before making a decision. If you added stripes, polka dots or used other painting techniques; tell us how you did it. First, we painted the ceiling all white and then created a circle around the light fixture. We measured the dimensions of the room so that we could be sure that the scalloped edges were evenly spaced. We then used Frog painter's tape and measured out the lines to each of the scalloped edges that we stenciled. What brand of crib did you buy and where did you buy it? We bought a Kendall low-profile crib in Simply White from Pottery Barn. What brand of nursery furniture did you choose and where did you buy it? I am only 5'2" so we specifically chose a low-profile crib due to my height. The custom upholstered recliner/glider was purchased from a local baby boutique called Sugar Babies in Sumner, Washington. The other furnishings in the room are refurbished, repainted pieces from elsewhere in the house. What baby bedding set did you use and where did you buy it? We decided to buy the Circus Theme toddler quilt included in the circus nursery feature in the Pottery Barn catalog to match the theme of the room as it worked with our color scheme. The rest of the crib linens were purchased at Target. Tell us about your nursery window treatments, nursery lighting, rugs, wall decor and accessories. Where did you buy them and were any handmade? The window treatments are Levolor brand cut to size black-out accordion blinds from Lowes. Lighting - Retro Photographer Tri-pod floor lamp from Target. Repainted table lamp - Ikea. Wall Decor/Decorative Accessories - various Etsy vendors. We added MDF molding to give the appearance of wainscoting on the walls. Other decorative touches, such as the wall art, were Etsy finds. How did you store all your baby's clothing and goodies? In storage baskets, on shelves? We installed shelving in the closet for storage from Home Depot/Lowes. We reused boxes covered with decorative scrap paper from all of the shipments for baby supplies to store toys and other goodies. How long did it take to decorate the nursery? Was it easy, fun, difficult? What was your favorite part of the process? The complete transformation of our baby boy's nursery took about 3 weeks. It was challenging but fun. My favorite part was adding the final touches and accessorizing. I think my husband's favorite part was the installation of the MDF molding on the walls. It really added an architectural feature to the room. Did you decorate the entire nursery on your own or did someone help you? Who? What was their contribution? My husband and I worked on the room together. He was primarily responsible for the ceiling and wainscoting and I was responsible for the decorating. I know that Unique Baby Gear Ideas' visitors will love your circus themed nursery but could you tell us what you love most about your completed room? I love that the space is bright, cheerful and happy, yet soothing and calming. It can also be used for a little girl if we re-accessorize it a bit. The painting on the nursery ceiling is amazing! I have seen several "big top" circus nurseries with painting techniques similar to yours on the ceiling and we plan to combine several styles to make ours unique. Are there any tips that you can share as to how to make our project go smoothly? I have never painted a ceiling even in a solid color before much less in a unique design like this and I can use all the advice I can get. Join in and write your own page! It's easy to do. How? Simply click here to return to CIRCUS THEME NURSERY PICTURES and DECORATING IDEAS.